In 2005, Hurricane Katrina devastated the Gulf Coast, becoming the costliest natural disaster in U.S. history at $125 billion. It also produced some of the most elaborate scams and schemes in modern history, costing taxpayers up to $2 billion. After the storm, FEMA provided immediate disaster relief and issued many reconstruction contracts for long-term rebuilding projects. The federal government, however, knew little about many of the companies involved, and some of them took advantage of the desperate situation to defraud the government out of millions of dollars. In one case, contractors inflated the number of meals served to cleanup workers. In another, hotel owners submitted six figure bills for nonexistent guests. Bureaucratic oversight was so sloppy that inmates collected more than $10 million in rental assistance. But one of the most egregious cases of fraud involved the National Flood Insurance Program (NFIP). While insurance against wind and rain damage is available from private insurers, flood insurance is generally not. The federal government established the NFIP to protect residents in flood prone areas. FEMA set up a program within the NFIP known as “Write Your Own” which allowed certain private insurance companies to issue government-guaranteed flood insurance policies in their own names. 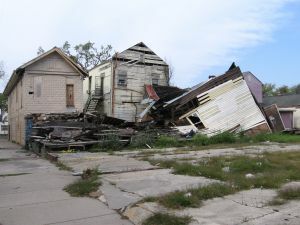 The damage caused by Katrina resulted in over 160,000 flood damage claims, the strain of which caused FEMA to relax the standards for submitting proof of loss. In April 2013, a jury found State Farm guilty of fraud after two whistleblowers claimed the company passed off the costs of paying for wind and rain damage to the government by fraudulently claiming that home damage was caused by flooding. The whistleblowers have since petitioned the Fifth Circuit for a significant expansion of their lawsuit. Natural disaster fraud does not just involve contracts entered into by FEMA. For example, the Department of Homeland Security (DHS) entered into a contract with Lighthouse Disaster Relief to build and operate a base camp for first responders assisting with the Katrina relief efforts in Louisiana. However, Lighthouse made false statements to FEMA that the work had been completed in order to be paid prematurely. As a result, the base camp could not sufficiently house the number of first responders specified in the contract. Lighthouse settled an FCA case with the government for $4 million. Natural disaster fraud is not just limited to hurricanes and flooding. Tornados, earthquakes, fires, blizzards, and even terrorist attacks can be targets for individuals and companies seeking fraudulent financial gain. For example, after the 2007 wildfires in San Diego, the city hired private contractors to clear home sites in Rancho Bernardo as part of a $9.4 million program administered by FEMA. A media investigation found that the companies overbilled the city by millions and failed to provide receipts to back up its invoices. In 2007, the town of Georgetown, Colorado was forced to repay FEMA tens of thousands of dollars when it inflated the cost of snow removal. More recently, allegations of fraud have surfaced in the aftermath of the Deepwater Horizon (BP) Oil Spill and Superstorm Sandy. Any company that has used the improper procedures listed above in those or other natural disasters can be the subject of a whistleblower lawsuit under the False Claims Act.